Nutmeg manikins are common on all main Hawaiian islands from sea level to the mountains and alpine regions (on the Big Island). They are native to Southeast Asia and were introduced to Hawaii around 1865. 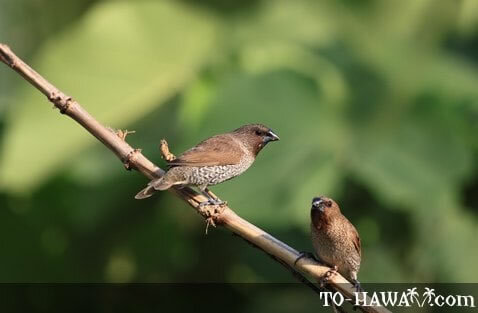 They are also known as spotted munia or ricebird. Adult males and females are similar in appearance. Adult birds have are brown with a chestnut-colored throat and a dark brown face. Their sides and breast is gray with dark accents. Their belly is whitish. They have a dark bill and legs. Their diet includes a variety of seeds. They typically stay together in large flocks. Nests are built in a low tree or shrub and between three and four white eggs are produced each breeding season.